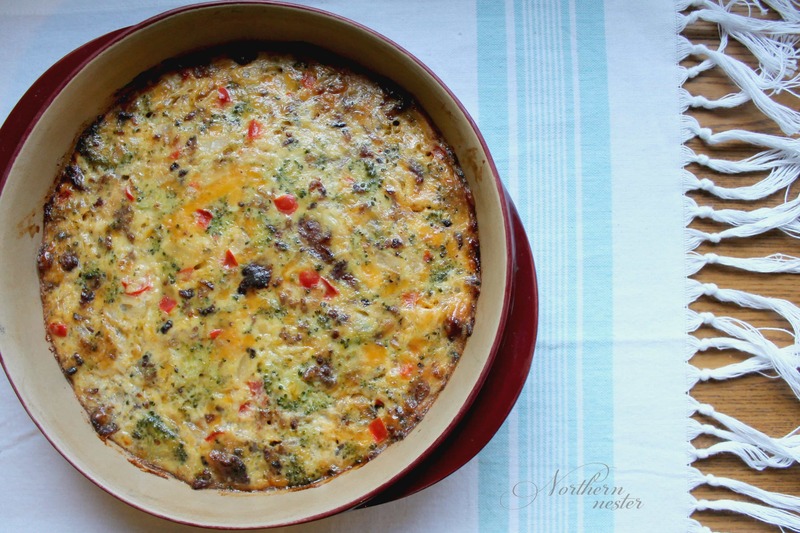 If you’re looking for a tasty, Trim Healthy Mama-friendly breakfast for Christmas morning, this egg bake fits the bill! Broccoli florets and red peppers give it a festive flair, and ground bulk Italian sausage provides plenty of flavor. The addition of cheese and cream make this dish a wonderful, easy, no-special-ingredient S.
A very flavorful, festive looking egg bake that's perfect for Christmas morning! A THM S.
Fry sausage in skillet until sausage is no longer pink. Drain excess fat and return to burner. Add in vegetables and cook until onions are clear and broccoli is tender-crisp. Remove from heat. In a separate bowl, whisk together eggs, salt and pepper, and cream. Stir into sausage and vegetable mixture. Stir in cheeses. Pour into a lightly greased 8" baking dish. Bake at 350 for 25-30 minutes.